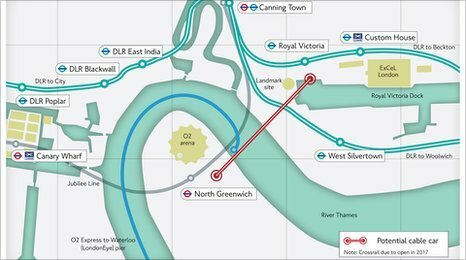 Transport for London has unveiled plans to link two of the main non-Stratford Olympic sites via a cable car between the north and south banks of the Thames. The concept for an east London cable car isn't particularly new: tentative plans for one to link the Millennium Dome and Canary Wharf were tabled in the late 1990s, and when he first became Mayor, Boris Johnson spoke with then-architectural advisor Richard Rogers about building a network of them in the Thames Gateway. The recession (and Rogers' dismissal) put paid to that, and Boris busied himself with an even more improbable Jetsons-esque transport plan. The new proposal, however, would see cable car stations built on Greenwich peninsula and the Royal Victoria Docks, near to North Greenwich tube and Royal Victoria DLR respectively. The route, suspended 50 metres in the air, would be capable of carrying 2,500 passengers (including cyclists) each hour, and would provide a direct link between the O2 Arena and ExCel centre in time for 2012. At a cost of £25m, the empty coffers of TfL means that the project would have to be funded privately, and talks are underway with private sector firms to that end. Leaving aside the questionable use in the Olympics — is there likely to be huge demand to get between these two relatively small venues? — the idea seems an excellent one. East of Tower Bridge there are few interesting ways of crossing the river. Building a cable car with panoramic views of the capital would be a huge hit, instantly providing east London with a conspicuous tourist attraction — one that could prove more popular (not to mention useful) than, say, a certain red-tinted structure.